As traders, we use technical analysis as a reliable method for speculating on future price direction of both equities (shares) and indexes. Technical Analysis in simple terms is the study of historic price movements in a chart in search of patterns or consistently traded support and resistance levels. Today we are looking at a specific chart pattern that falls under continuation patterns, the Descending Triangle. A down trending stock that has lower peaks and troughs. 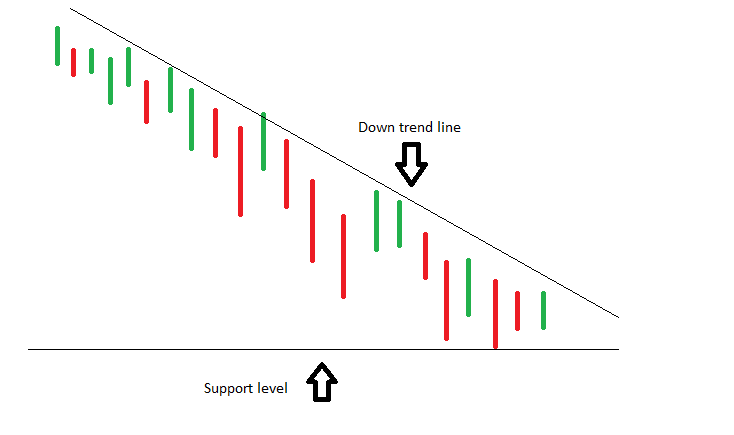 A support level where the stock is channeling towards. Both trend lines create a triangle forming in the bottom right of your chart. Important Note: Be aware, this pattern will not be confirmed until the share price breaks through the support level and continues the downtrend. Woolworths has been on a midterm downtrend ever since bouncing off resistance at $31.50. With the downtrend forming lower peaks and lower troughs, it look to be that WOW will start falling further and start to test the support level at $27.15. As the stock has continued to do this, should it break the support level at $27.15, it will look strongly bearish and probably head back to $26.15.